Get ready for some of the most amazing bald eagle facts for kids. Commonly found in the North America, Bald Eagles supersede all other birds in their hunting techniques, their exceptional vision and physical appearance. Bald eagles belong to the group of sea eagle and fish-eagle. Apart from its real characteristics, bald eagles do have cultural significance in that the United States of America symbolizes bald eagle as their national bird and is often called American Bald Eagle. Generally living in most parts of Alaska and Canada, these vigilant birds are ordinarily found in the areas where water is in great quantity, and in the places of oldest grown-up trees for building their nests. Bald eagle is not actually bald rather it has a white-snowy head, which gives an elegant look to this bird. One of the notable yet shocking facts is that bald eagles were at the verge of extinction in the late 20th Century especially in the United States. The population of bald eagles in the 18th Century was around 500,000 to 700,000 however, the figure steeps down abruptly in the mid-20th Century with only 410 nesting pairs left in US. Bald eagles have actually white head with the brown body color. There is no significant difference in the sizes of males and females; however, females are slightly greater in magnitude as compared to the males. Roughly estimate of 25% plumage difference. Bald eagles have a sharp yellow-colored beak with bare strong toes and talons. 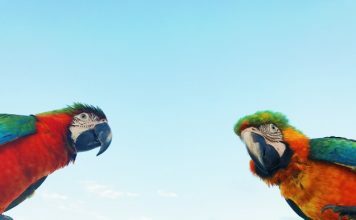 These birds have a large hooked beak pointed slightly downwards for a firm grip. The sharpness of the talon is so much so that it completely penetrates into the kill while crushing all the tissues in its range. The prey when held strongly by the bald eagle claws is unable to move. Bald eagles are comparatively different from the Golden eagles since it has a sizable beak. Besides, the horizontal wings of bald eagles are not enough to wrap around its feet absolutely. Not always bald eagles are believed to be the largest raptor in the North America after Condor. Bald eagle facts lead us to believe the great eagle sizes in that the length ranges from 70 cm to 102 cm (28 to 40 in). When it comes to the wingspan, the length measures from 1.8m to 2.3m (5.9 with 7.5 ft.). 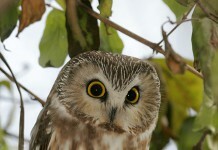 These watchful birds have a mass of about 2.5 kg to 7 kg (5.5 and 15 lb). The average size of the female are 5.8 kg (13 lb) accompanied with the males’ size of 4.1 kg (9.0 lb). The location also plays a pivotal role in defining the size of the bald eagles in that the smaller bald eagles belong to Florida weighing only 2.3 kg (5.3 lb) together with a wingspan of 1.68 m (5.5 ft). 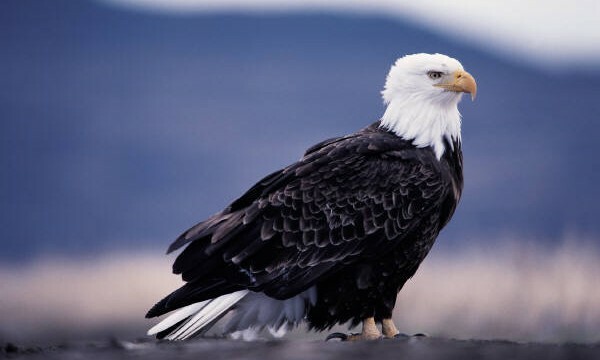 The notable size of bald eagles is observed in Alaska where it weigh 7.5 kg (17 lb) and a wingspan of 2.44m (8.0 ft). Bald eagles are capable of making biggest nests that can be 2.5 m (8.2 ft) wider, the depth of 4 meters (13 ft), and weighing about 1 metric ton (1.1 tons). Bald eagle facts also demonstrate the average age of these birds i.e. 20 years; however, the maximum age proceeds to 30 years. Bald eagles have robust talons in that they can even held 15 pounds of weight whilst flying. Bald eagles facts illustrate us that the bald eagles have ten times more gripping power as compared to humans. You’ll find a mixture of brown and white color in the Juvenile bald eagles. There are more than 7000 feathers of bald eagle. Roughly speaking there are almost 10,000 breeding bald eagle pairs. Juvenile bald eagles deem to have a larger wingspan. They are capable to focus any prey within the range of 2 miles since these birds have 7 times more powerful resolution as compared to humans. In winter, bald eagles tend to spend more than 90 per cent of the time on roosting. Unnecessary shooting is the main cause their extinction. However they also die of hunger on many occasions. H. l. leucocephalus (Linnaeus, 1766): It is the appointed subspecies. Commonly lived in Southern part of the United States.bald eagle facts. H. l. washingtoniensis (Audubon, 1827): These subspecies are normally found in the Northern part of the United States. Bald eagle facts turn our attention to the habitats of these birds in that they tend to live nearby rivers, oceans, and other places where water is abundant. The study of bald eagle facts show us that these birds fancy their living adjacent to the lake of about 10 sq (4 sq. miles) since these are the ideal conditions for their breeding. Apart from living close to water, bald eagles also wish to live on the fully-grown trees for the purpose of nesting. These trees ought to have a better visibility for bald eagles to live on. The height of the trees can be compensated if there are bunch of trees around. Almost half of the forest must have been roofed by the trees to allow bald eagles. Being highly susceptible to humans bald eagles are generally believed to exist in the deserted places. The Squamish and Cheakamus rivers are the primary meeting places of bald eagles. While piercing deeply into the bald eagle facts some of the unknown details come to the surface such as the express speed of 56 to 70 kilometers they reach. The bald eagles reduce their speed to 48 kilometers when gliding toward seizing the fish at the water surface. The diving speed ranges from 120 to 160 kilometers per hour (75 to 100 mph). Bald eagles are actually the migratory birds that wholly depend on the location. In places where water becomes scarce or frozen these wary birds start moving around in search of their feed. The routes are typically chosen on the basis of food resources. Normally bald eagles migrate in the daytime under the sunlight. 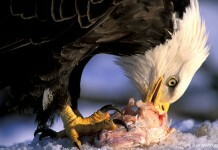 Bald eagles mainly center their diet on fish hunting. Most notable amongst which are salmon and trout. 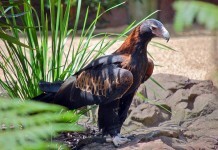 Apart from fishes, carrion is also the major part of their diet. Bald eagles make their living by hunting rabbits, hares, muskrats. Among the avian classification these birds dump their hang-ups on grebes, ducks, egrets, geese, and coots. Occasionally bald eagles also hunt larger preys such as swans. Reptiles and amphibians also turn out to be a prime part of their diet. When dipping onto the water surface bald eagle grabs fresh fish and the eating process involves tearing off with one claw while holding firmly with another. When it comes to sharing food bald eagles are the worst i.e. they tend to dictate even land animals like foxes and other mammals. 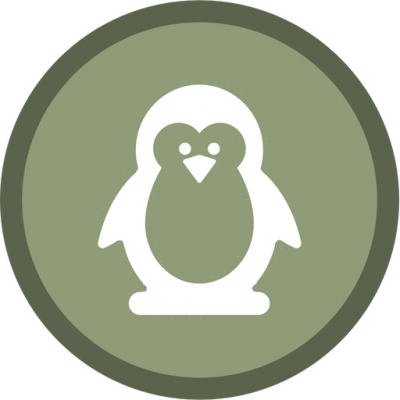 They also dominate birds like vultures, raptors, and gulls. However, golden eagles are capable to stand out bald eagles. These birds can store 2 pounds of food in their crops for near future. As mentioned earlier bald eagles become mature after four to five years. 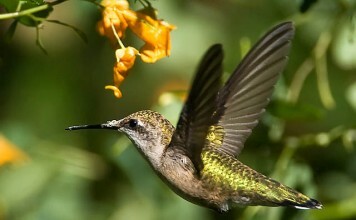 These birds choose their mates for a lifetime; nevertheless, they might fancy other companions when the older one dies. Besides, if a pair turns out to be unsuccessful in continuous breeding they leave and search for the new ones. In case there are no huge trees; birds tend to breed on the ground, even though it happens occasionally. 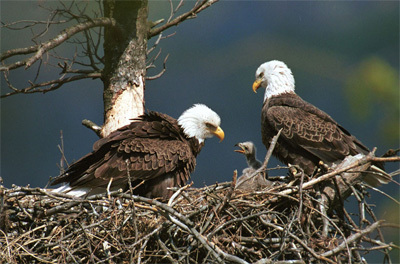 Bald eagle facts reveal out that these birds lay eggs between 2 to 3 annually. The eggs weigh about 73 millimeters (2.9 in) in length with the width of 55 millimeters (2.2 in). real information. It gave real cool facts that I didn’t even know. I recommend it!